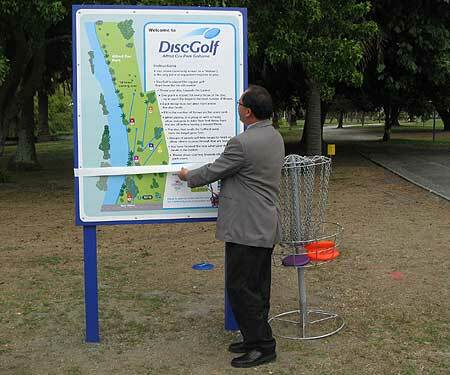 Welcome to our summary archive review reminiscent page for the year 2009 for Disc Golf in New Zealand, brought to you by Gentil Sport. Enjoy! After the success of our 09 NZDG Champs in this park back in February everybody was looking forward to another crack .. this time playing the intriguing Match Play format, anything could happen. For story, pics and results click here. Stunning weather, shoking scores by Bruno and a guest appearance by the Mighty Mexican all stacked up for a memorable weekend of disc golf. Story, pics and results here. A successfull weekend with 35 players enjoying the beauty and challenge of Monte Cecilia Park. The winter solstice always holds the promise of light winds and fine weather and for one of the rare occasions not a cloud was seen for the whole duration of the event but jeepers did the wind play havoc on Saturday. Click here as TD and Local Golfer Marty de Haas tells the story. It’s a picturesque place for a Disc Golf course on the sunrise side of the Kaimai Ranges overlooking the rolling green hills in the foreground with the beautiful BOP and The Mount as a back drop. Sometimes the vistas can make you forget the perils of possibly the toughest course we play on the Tour. But before long you’ll be jolted back to reality as your drive on a 120 metre hole ends up 300+ meters from the basket! ‘Tauranga Xtreme’ does that to you. For the full story from the TD, results and pictures click here. The call from hosts ‘The Lost Tribe’ came through - the traditional Hill course had been deemed 'unplayable'. But for many in the know, this meant the back-up (and wonderfully re-designed) Polo-Cross Grounds would mean for four rounds that would be easier on the body. This did not mean, however, that the competition would be less fierce. In fact the lead changed more times than Auckland weather in a day! For the pictorial coverage, story and results click here. I probably spend more time with my camera in my hand than my discs on my Queenstown sorties. Wherever you look in the beautiful surrounds of the Southern Alps there is a picture to be taken. Along with the great scenery evidently there was some brilliant Disc Golf played as well. 3 New Disc Golf Courses for Northland! The word is out Disc Golf is starting to grow and new permanent courses are starting to spring up around the country. Gentil Sport has been working with numerous councils and agencies and the response has been brilliant. Click here to see some you may not know about yet. A New Disc Golf Course for Gisborne! Gisborne Mayor Meng Foon Cuts the ribbon at the official opening of the Alfred Cox Disc Golf Course in Gisborne. Congratulations to Josh and Allie and the Hamilton Hornets Disc Golf Club for hosting a fantastic tournament. Great course, brilliant weather, excellent turn out, fantastic hospitality and a high standard of Disc Golf. For the full story, pictures and results click here. A great turn out to the opening event on the NZDG 2009 Tour. Everyone keen to grab early points and get their year off to a flying start, not to mention play the 18 permanent baskets on the beautiful Waiheke Island course just a short ferry ride from downtown Auckland. 2011 was another ripper of a year for disc golf in New Zealand. We saw record numbers in the Tour, a great showing by our Kiwis at the Aussie Champs, magical Nationals in Hamilton, a new course at one of New Zealand's most popular mountainbiking parks and much, much more. 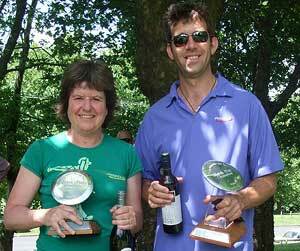 So grab yourself a brew, kick back and enjoy our dedicated page The Year That Was NZ Disc Golf 2011. 2010 saw Queenstown Gardens achieve the full 18 basket status. We crowned a new National Champion, hit the Australian Open, played with the New Zealand cricket team (the Black Caps) and of course visited all the fantastic Kiwi disc golf destinations as part of the 2010 New Zealand Disc Golf Tour. We have summarised the year for you on our dedicated The Year that was NZ Disc Golf for 2010 page. What a year 2008 was for Disc Golf in New Zeland. The New Zealand Tour visited some exotic locations for disc golf in pristine and sometimes challenging conditions. Not only that, but we also visited the Australian Disc Golf scene not once but twice! We have summarised the year for you, with some of the best pictures and memories that will last for all time. Plus stories from such Kiwi Disc Golf icons as Pete Crowther, Marty 'Scratch' de Haas and more.